Your vehicle can only be driven with the Intelligent Keys which are registered to your vehicle’s Intelligent Key system components and NISSAN Vehicle Immobilizer System components. As many as four Intelligent Keys can be registered and used with one vehicle. The new keys must be registered by a NISSAN dealer prior to use with the Intelligent Key system and NISSAN Vehicle Immobilizer System of your vehicle. Since the registration process requires erasing all memory in the Intelligent Key components when registering new keys, be sure to take all Intelligent Keys that you have to the NISSAN dealer. Do not allow the Intelligent Key, which contains electrical components, to come into contact with water or salt water. This could affect the system function. Do not drop the Intelligent Key. Do not strike the Intelligent Key sharply against another object. Do not change or modify the Intelligent Key. Wetting may damage the Intelligent Key. If the Intelligent Key gets wet, immediately wipe until it is completely dry. Do not place the Intelligent Key for an extended period in an area where temperatures exceed 60°C (140°F). Do not attach the Intelligent Key with a key holder that contains a magnet. Do not place the Intelligent Key near equipment that produces a magnetic field, such as a TV, audio equipment and personal computers. If an Intelligent Key is lost or stolen, NISSAN recommends erasing the ID code of that Intelligent Key from the vehicle. This may prevent the unauthorized use of the Intelligent Key to operate the vehicle. For information regarding the erasing procedure, contact a NISSAN dealer. The Intelligent Key contains the mechanical key. To remove the mechanical key, release the lock knob on the back of the Intelligent Key. 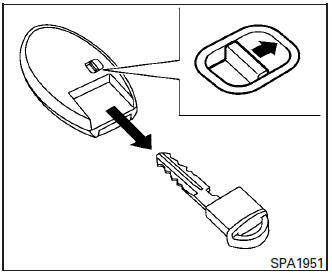 To install the mechanical key, firmly insert it into the Intelligent Key until the lock knob returns to the lock position. Use the mechanical key to lock or unlock the driver’s door. Always carry the mechanical key installed in the Intelligent Key slot. For additional information, refer to “Doors” in this section.